If you know anything about coffee—good coffee—, you know the Moccamaster name. And you probably also know that they’ve yet to make a coffee maker that doesn’t deliver. Still, a Moccamaster of any type is quite an investment in your coffee habit, so choosing the right model is important. The Technivorm Moccamaster KBG is a drip coffee maker with an on-point trendy yet classic design and numerous extra features. 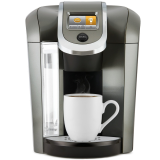 Some of the Moccamaster KBG’s standout features include quick heating and brewing (a full pot in six minutes), energy saving features like a heating element that switches off automatically, and a wonderfully engineered hot plate. This stylish model comes in a staggering array of color schemes, from audacious lime to sedate silver. 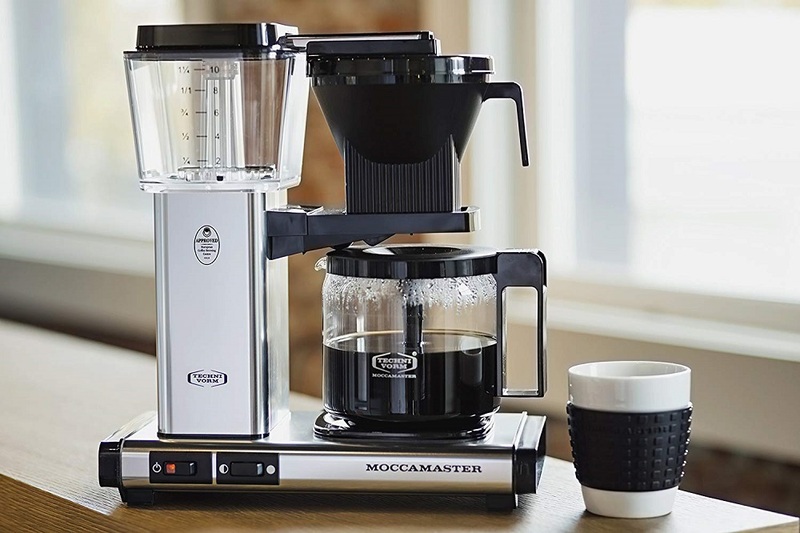 While there’s never been a coffee maker that looked quite like the Moccamaster KBG before, you may still find there’s something familiar about its design. It’s not the form factor exactly, but the overall effect of the minimalistic look, the precision angles, and even the logo placement. Together, these design choices create an almost retro-futuristic/mid-century effect. This effect can be heightened or subverted, of course, depending on your color choice. The juicy lavender “grape” option, for example, plays up the machines modernity. The “turquoise” option, reminiscent of the pale pastel shade favored for certain models of classic cars, ramps up the nostalgia factor. For the less adventurous, there are an array of gloss black, matte black, white, and grey options. Whether you choose brick red, royal blue, or even bright, eye-catching yellow, you’ll be getting a gorgeous machine. The color you choose covers the slim, rectangular base as well as the tower which supports the reservoir. The reservoir itself is transparent plastic, while the filter basket and support are black plastic (much like the rest of the machine’s trim). The carafe is dainty, geometrically cylindrical glass. The machine only has two simple switches, which, with their white icons on black plastic, nicely complement the overall effect. A heated base has become a relatively rare find in the upscale coffee machine market. But not only does the Moccamaster KBG have a heated base, but it also has a precisely (and cleverly) engineered one. Plus, the hot plate is a separate heating element from the one that heats the water to brew. This is an excellent choice because it accomplishes two things. First, it allows each heating element to work as efficiently as possible. The major heating element, which is copper, and contained in the machine’s tower, is capable of heating water to the perfect brewing temperature extremely quickly. 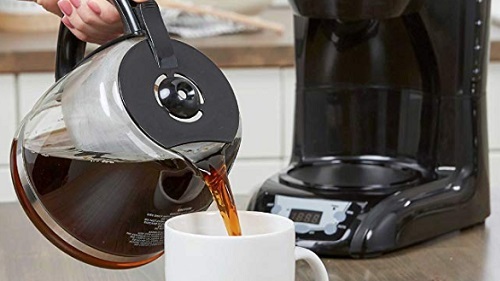 This allows your pot to brew in about six minutes. Second, the independent hotplate is free to keep the carafe at a perfect, non-scorching temperature. It even has two settings, with the “low” setting at around 175 degrees Fahrenheit, and high at about 185 degrees. The Moccamaster’s style and engineering might be its most showstopping qualities, but there’s more to this appealing coffee maker than those two things alone. For one thing, the water reservoir has clear volume markers, in both cups and liters. No need to pre-measure for your morning pot! 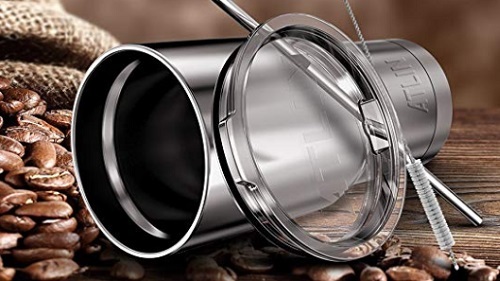 Other little perks that speak to this manufacturer’s attention to detail include the wide mouth of the reservoir, which makes it easy to fill and clean, and a spill-preventing automatic drip stop. Speaking of being easy to clean, the entire machine is designed with easy cleaning in mind. Most of the components sit comfortably in place, no snaps or attachments. That’s an especially good thing because it’s recommended that you stick to washing the Moccamaster KBG by hand. It might not be as convenient as being able to pop it into the dishwasher, of course, but the overall design is extremely simple to break down for a quick, painless cleaning. There’s a lot to love about this ambitious, stylish, and effective little coffee maker. There’s the iconic design, the numerous hues to choose from, and the exceptional performance of its dual heating elements. There’s little doubt that this gorgeous little machine is capable of making a great cup of coffee. If there’s one thing that you might not fall in love with, it’s the carafe itself. 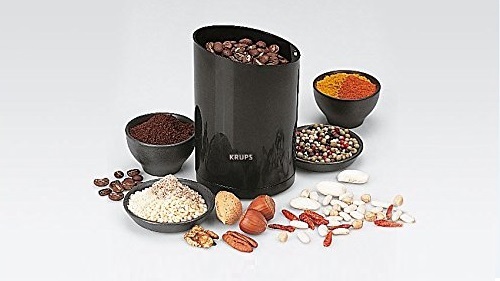 It looks fantastic, with its black, angular handle and dainty cylindrical design. However, it doesn’t have the versatility (or likely, the durability) of a thermal carafe. It’s possibly not the best choice if you have, for example, a bustling morning routine where it might get elbowed off the counter.